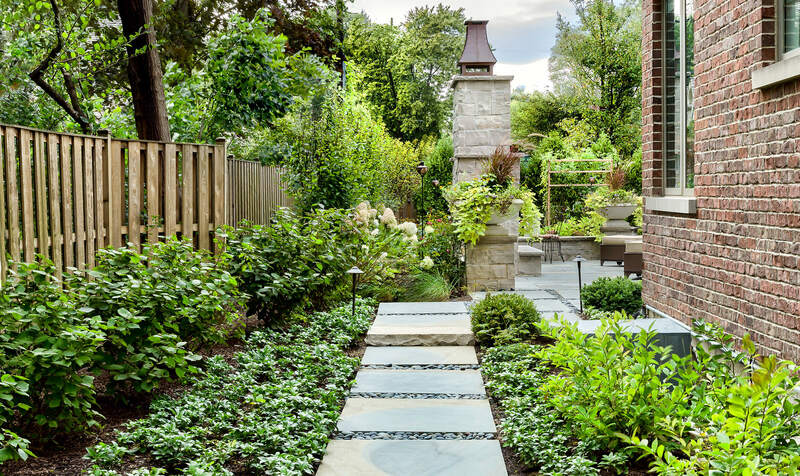 Soon after purchasing this European-inspired home, the new owners made big plans to renovate the landscape in keeping with the spirit of old-world formality and craftsmanship. 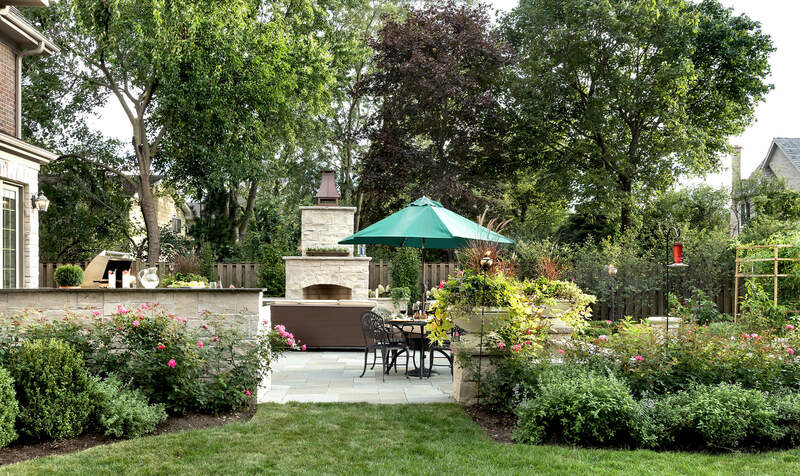 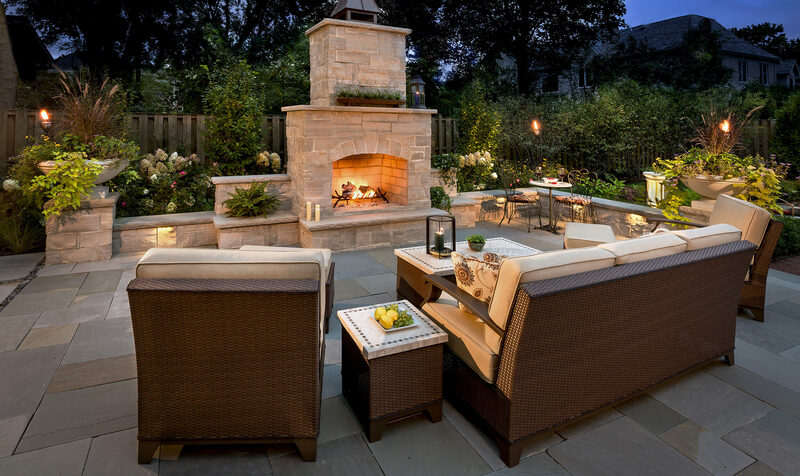 Former city dwellers, they now wanted to embrace outdoor living in a big way with flower-filled gardens in which to display their collection of art and sculpture, a large patio and outdoor kitchen for entertaining, an outdoor fireplace, and a manageable culinary garden reminiscent of ones they encountered on their travels through Europe. 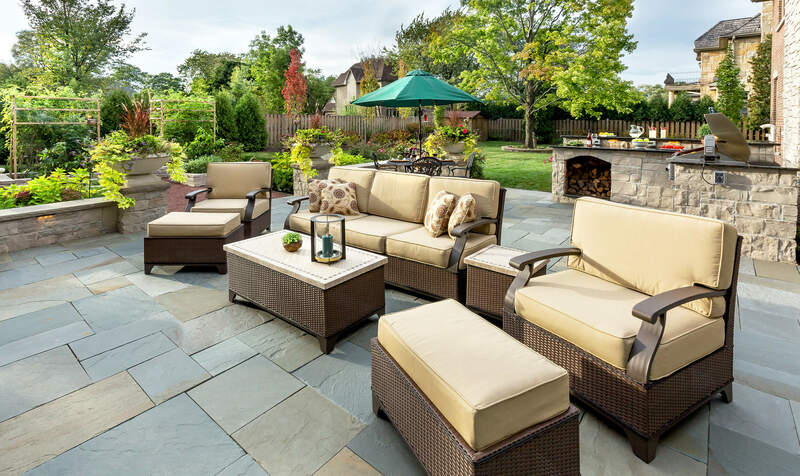 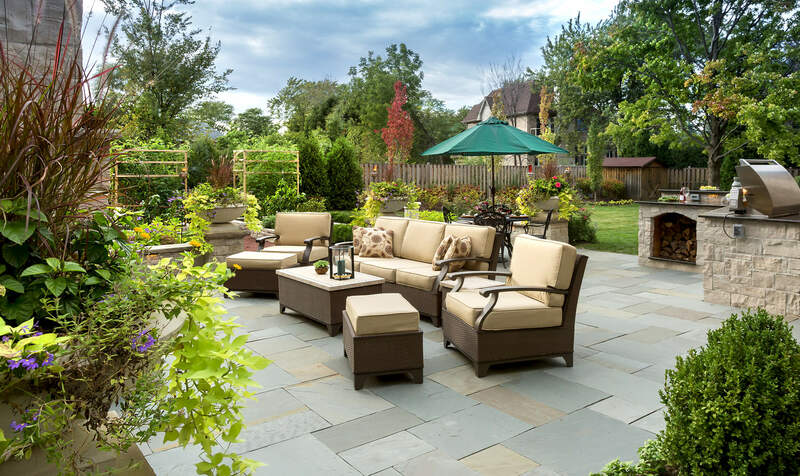 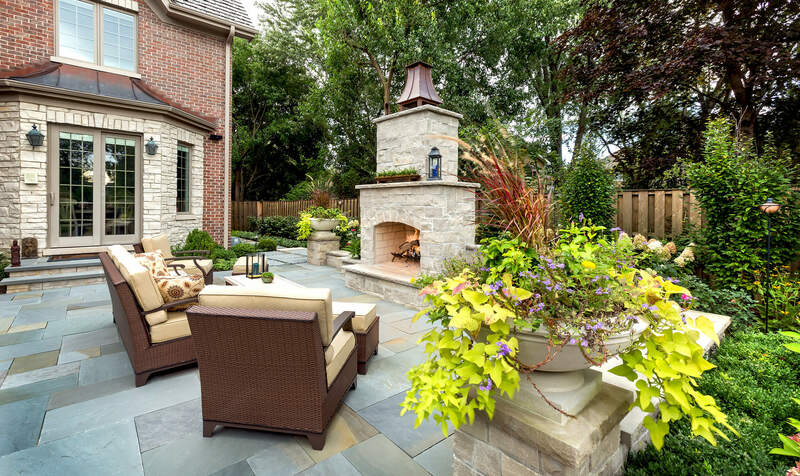 The main outdoor living space is large bluestone patio that features an elegant custom-built stone fireplace as the focal point. 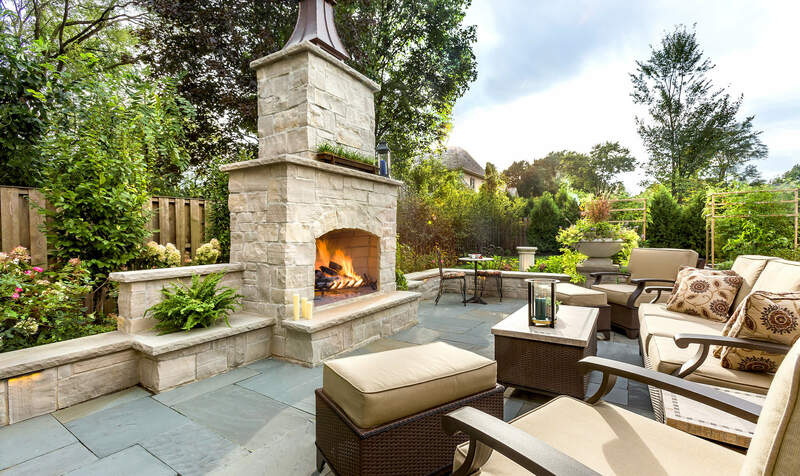 The fireplace is situated a required 10’ from the property line, providing an opportunity to create a layered border of columnar, sentry-like trees and flowering shrubs along the fence line. 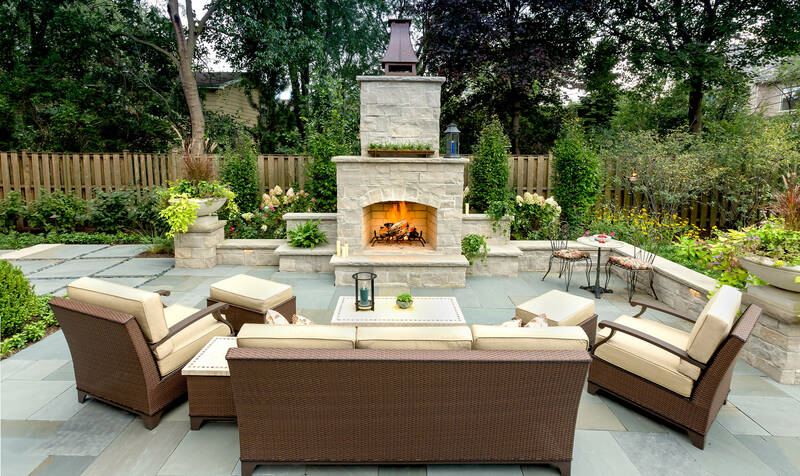 Wing walls and stone ledges provide additional seating and display shelves. 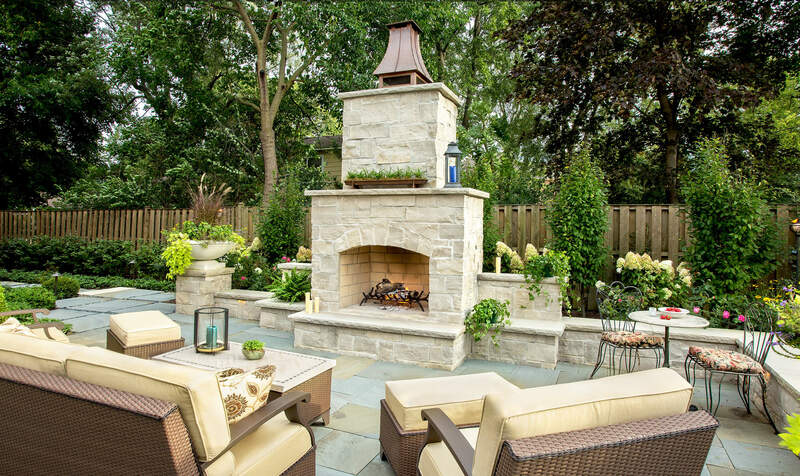 The weathered limestone exterior and custom-crafted copper flue impart a French flair. 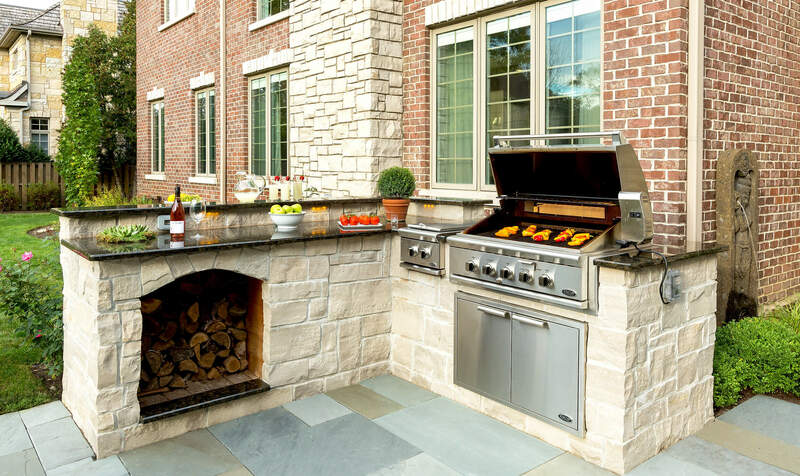 The cook station, situated near the entry, was designed to accommodate appliances selected by the clients, and provide a convenient nook for firewood storage. 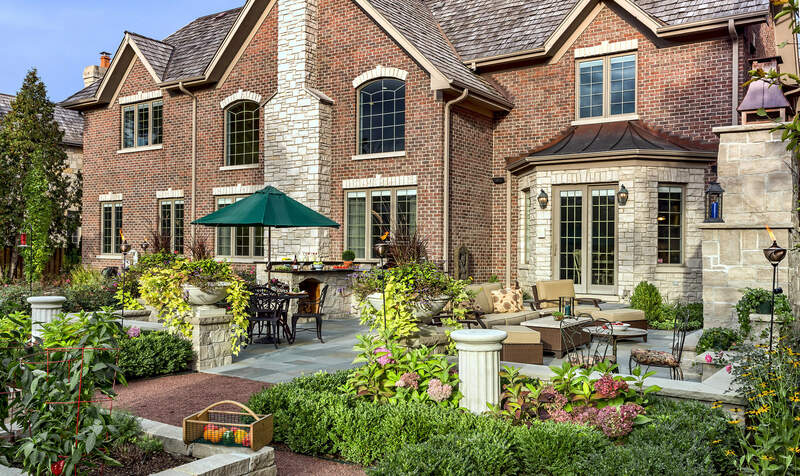 On an adjacent wall, the owners Indonesian wall fountain is installed where it can be seen and heard from inside the house. 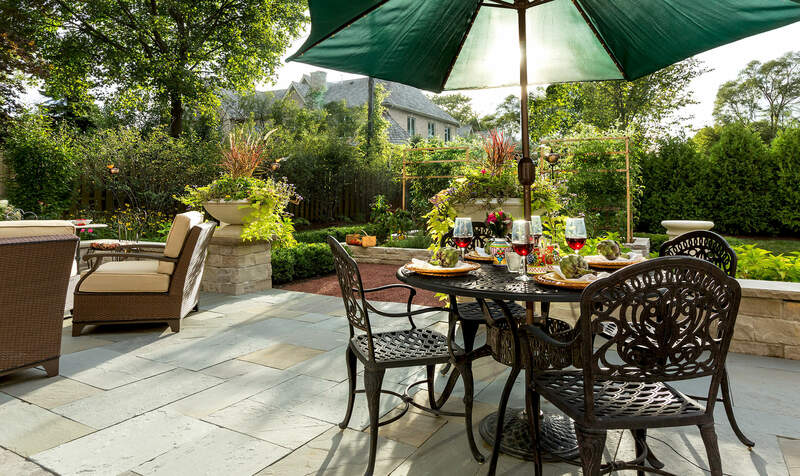 The culinary garden serves up function with flair. 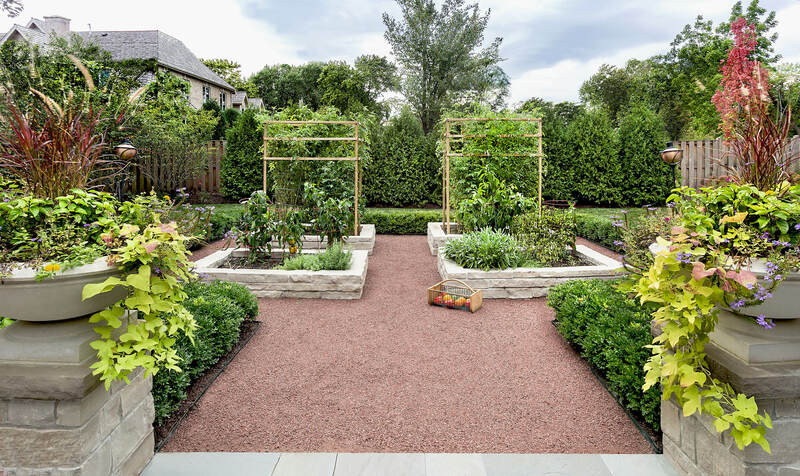 Stacked limestone walls elevate the beds to provide optimal drainage and make harvesting effortless, while a drip irrigation system eliminates the need for hoses. 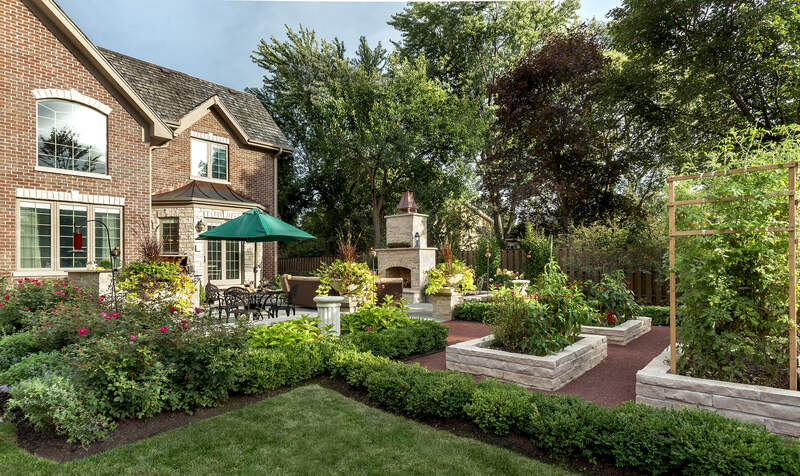 A pair of architectural columns from the homeowners collection stand amid flowering shrubs, surrounded by boxwood hedges. 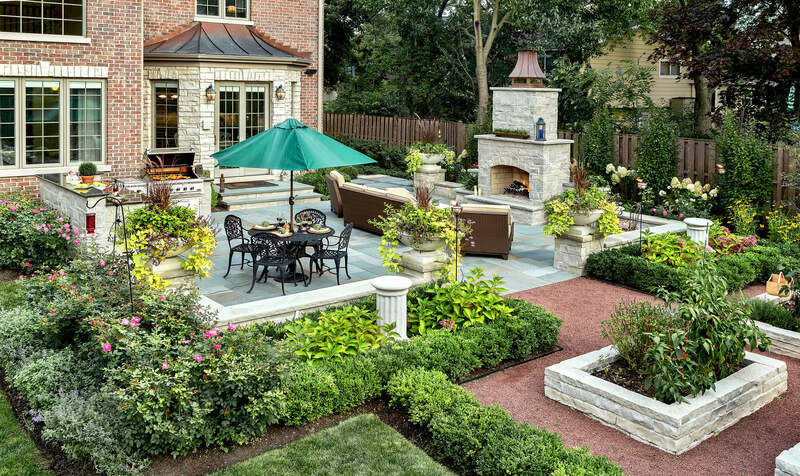 The garden floor is composed of a crunchy crushed granite which contrasts with the smooth bluestone patio. 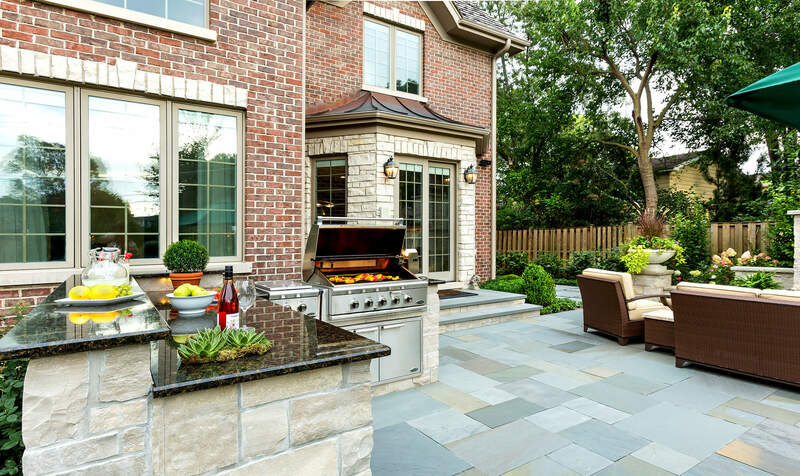 The granite is a permeable material and therefore isn’t calculated into the impervious surface limits for the property. 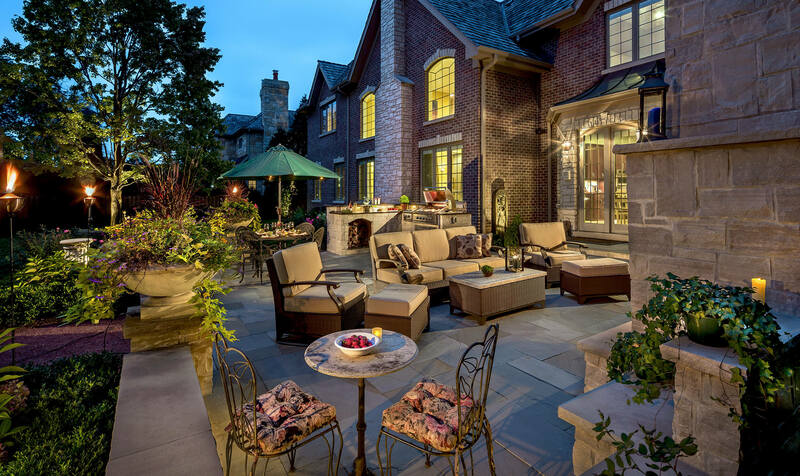 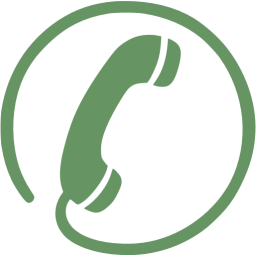 This allows the homeowners to move ahead with a planned addition to the house – a glass conservatory, which will be located at the other end of the property. 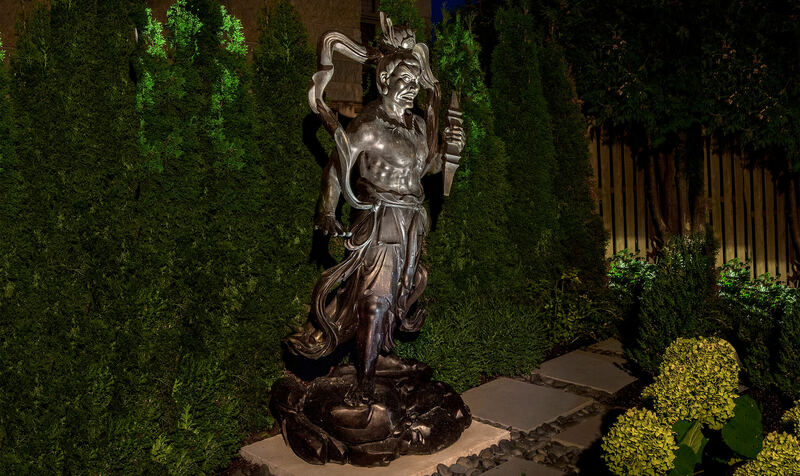 Landscape lighting brings out the beauty of the garden when day turns to night, inviting exploration of the plant collections, as well as revealing hidden delights such as the glowing statue of the Japanese temple guard.